This entry was posted on Monday, January 24th, 2011 at 10:16 pm and is filed under Uncategorized. You can follow any responses to this entry through the RSS 2.0 feed. You can leave a response, or trackback from your own site. oh no! Mona! ;-; She’ll have to shed her skin..
Actually people do that too.. so superglue is never TOO permanent..
Wouldn’t she get glue on herself regardless of failure or not? 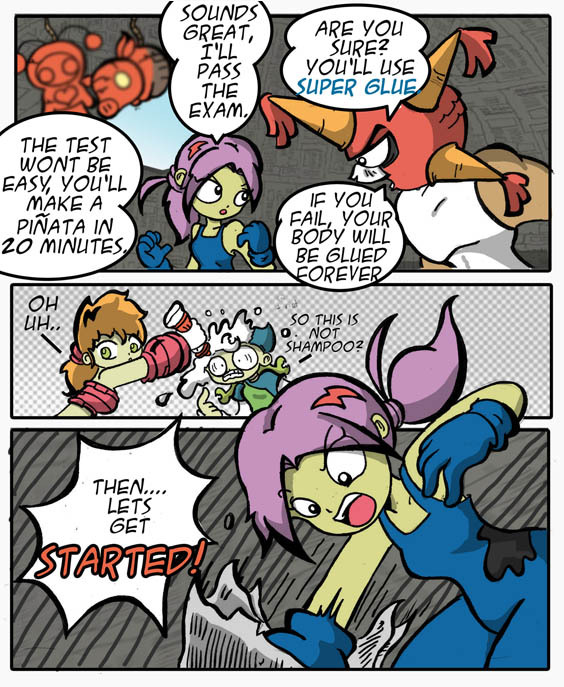 Is that a chapulin pinata in the first frame? Hehehe, I like how super glue is colored blue, yes I’m a WoW geek. Also I’m pretty sure it’s suppose to be Uh-Oh not Oh-Uh. I haven’t slept in 2 days so forgive me if I’m wrong. Also is Pilli not wearing anything under that apron?